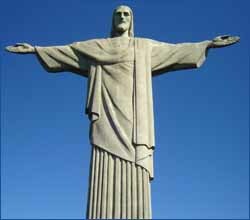 Christ the Redeemer (Cristo Redentor, 1931) opens his arms in blessing in this 100 ft. statue on a 20 ft. pedestal, atop the 2,300-foot peak of Corcovado Mountain overlooking Rio de Janeiro, Brazil. Designed by Paul Landoviski (French-Polish monumental sculptor, 1875-1961) and built by engineer Heitor da Silva Costa. Larger image. How do you live a Christ powered life? How can you mature as a Christian? How do you get victory in your struggle with sin? It is hopeless? By no means! Christ's Spirit makes the difference. Though the Christian life is sometimes hard, in a Christ-centered life there is a place of victory over sin. It comes through faith as well as an understanding of who we are in Christ and how the Christian life is supposed to work. In this free 8-lesson online Bible study, Pastor Ralph takes you through some of the most powerful chapters on Christian living found in the Bible -- Romans 5-8, the golden core of Paul's magnum opus, his Letter to the Romans. Is this passage difficult to understand? Yes. You'll be stretched. Your conceptual world will have to expand. But you'll find that the time you spend in studying Romans 5-8 will pay rich rewards, for it will move you closer to a Spirit-filled life that you will enjoy in spite of the struggles you experience. We Now Have Peace with God (5:1-11). God has gone to great expense to reconcile us to him. United to Christ, the Second Adam (5:12-6:5). United with Christ, Free from Sin's Slavery (6:1-11). Christ's death weakens our sinful nature so that we can have victory over sin. Includes an excursus on baptism by immersion. Slaves to Righteousness Rather Than to Sin (6:12�23). Sin is no longer our master, Christ is! Struggling with Sin in Our Own Strength (7:1�25). Our flesh or sinful nature is no match for sin's power -- even with the insight of the law. Learning to Walk by the Spirit (8:1-17). Only when we are led and empowered by the Spirit can we be free from sin's dominion. Revealing the Children of God in Future Glory (8:15-28). The Spirit testifies that we are sons of God who will be fully revealed at the Resurrection. We Are More than Conquerors through Christ (8:28-39). God is determined to see us through to the end! This is our 28th online Bible study since 1996. If you've participated in one before, you know how God can use them in your life. If not, then you have a treat in store for you. I am an ordained American Baptist pastor, currently ministering in a Covenant congregation. I'm here to serve you as your guide to the book of Romans. -- Dr. Ralph F. Wilson. About the leader. I invite you to journey with me and thousands of brothers and sisters world-wide through a study of the Christ Powered Life (Romans 5-8). Here's how we'll study together. Each Saturday I'll e-mail you the lesson for the week. Then you'll read the Bible passage and use my notes to help you understand it better. On Sunday, Monday, Tuesday, and Wednesday you'll receive a question from that week's lesson to think about and answer. This is designed as a "total immersion" approach to Bible study, since I believe God wants to use these lessons to work real and permanent change in your life. (You can opt out of the daily questions if you like, however, and just receive the weekly lessons.) You'll be thinking about these passages constantly over these weeks -- long enough for God to work his Word into your life and lifestyle. You can respond to the questions and exercises using the Joyful Heart Bible Study Forum -- and read others' answers to reinforce your own understanding. With each lesson you'll receive a link to a 20- to 30-minute audio teaching that sums up the passage you've been studying that week. Some who learn better from hearing than from reading really appreciate this. Then on Saturday, I'll send you the next week's lesson. "Helped me get into the meat of the word. I am past the milk stage." Why don't you sign up right now -- and then encourage some of your friends to sign up and study along with you. Weekly lesson, daily questions (same as weekly option, except you receive a question or two each day for 3 or 4 days to keep your mind on the lesson during the week). You'll receive your first lesson the Friday after you sign up. There is no cost to participate in the study, though donations are encouraged so we can create more studies and reach more people. We respect your privacy and never sell, rent, or loan our lists. Please don't subscribe your friends; let them decide for themselves. Please don't sign up for more than one of my Bible studies at one time. There's no penalty, but each of them is pretty intensive. If you try to do too many studies at the same time without adequate reflection, you'll miss out on God speaking to you.